This OMI “Oxford Medical Instruments” PEMF mat is new in the box. The box has been opened but the product has not been used. The Full Body OMI PEMF Therapy Mat is used for both professional and home use. What are the primary uses for this device? The OMI PEMF Therapy Mat is used for assistance with a wide variety of health concerns. Some of the most common uses for the PEMF Therapy Mat include: Pain Relief including Chronic Pain, Stress Relief, Reduced Inflammation, Increased Circulation, Better Sleep and many more. What part of the body is it used for? The OMI PEMF Therapy Mat is designed for full body use. How big is it? It measures 65 X 20 inches and has a quad fold design for compact storage. The OMI PEMF Therapy Mat should be used on a firm surface. How strong is the pulse? 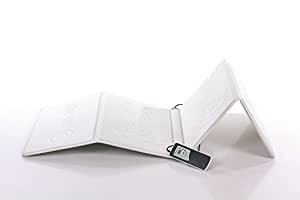 The OMI PEMF Therapy mat provides a field strength between 20 and 66 Microtesla depending on the frequency being used. What waveform does it have? The OMI PEMF Therapy Mat uses a square wave. What coils does it have? The OMI PEMF Therapy Mat has 8 pure copper coils. These copper coils provide even pulsed electromagnetic fields to the whole body. How long does it take to see results? Results vary on a case by case basis. The pulses from this device are from the top side of the mat which provide direct nerve and cell stimulation for the whole body.